The market is right a breaking point. 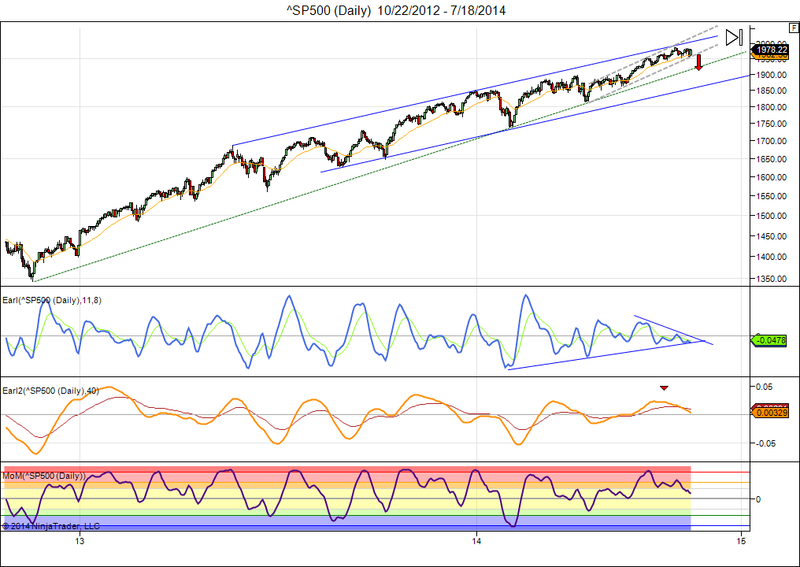 A narrow 3 month up trend channel supports the market at current levels, but any drop below 1950 would not bode well. On the upside a +2000 print remains possible, and would become inevitable if this narrow trend channel is to hold up for another month. Meanwhile my technical indicators continue to point downwards, and the weekly MoM for the S&P has now turned down as well. So, this is not a setup I want to buy or stay heavily long. At best we are in a sideways correction, but the risk for a sudden downside acceleration is quite high. We have been in a higher highs and higher lows pattern since mid April. Once that sequence ends the S&P will drop 100 points quickly imo, much like it did in January.